We bring an international marketing experience and knowledge to everything we do. We work closely with you to help identify and surpass your marketing goals. We know that every client has unique needs and that is why we build specific marketing strategies to benefit your business. 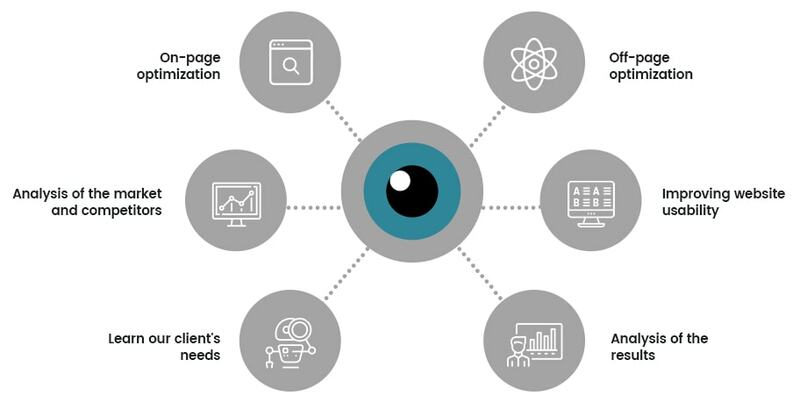 We assess, build and improve every aspect of your brand’s visibility, providing tailored solutions for SEO, CRO, online brand reputation management, along with content creation and translation and localization in a single country, or around the world. Using powerful and effective SEO techniques, Digital Pivot can help your business improve its organic visibility across a wide range of search engines, in multiple target markets. Our goal is to help your business derive as much benefit as possible from SEO activities with targeted traffic and premium search real estate. Your business will never have an asset more valuable than its reputation. Proactive reputation management shapes the conversation and enhances the trust in your brand. Reputation management is a competitive advantage in the modern era, with 8 out of 10 consumers trusting what they read online as much as personal recommendations. A comprehensive, highly professional content translation service, created by native-speaking translators to ensure your key messages reach the right audience, with the flow, cadence and quality they expect. We’ll also optimize the translated content, so you can launch with confidence. By diving into the stats and data generated by your web visitors, we can help you make the most of your traffic. Enhanced user experience will result in a higher percentage of visitors making a purchase. We’ll look at everything from bounce rate, to which pages perform, giving you the insight you need to boost your bottom line. We combine our experience, knowledge and the latest strategies and tools to boost awareness of your brand. We work with you to build a holistic, tailored approach to cultivating a customer base – one that values your brand and comes back time after time. With our content translation and SEO optimization services, you can get your content working in multiple markets, appealing to the right audience and significantly improving your ROI. Working with a clear SEO strategy, Digital Pivot can help you improve your search engine rankings and put your brand in front of the right people, at the right time, for the keywords that matter to your business. Do you want to get results? Digital Pivot offers a premium, tailored approach to digital marketing. We use our years of experience to help your brand meets its goals. We know that visibility is key in the ever-changing internet landscape, and that’s why we work with you to provide targeted and adapted solutions for any target market. We bring together experts in branding, SEO, marketing, reputation management, and conversion optimization to achieve success for your business. Our team takes the time to learn everything they can about your needs, creating a customized strategy to fit with your goals. When you’re ready to take your business to the next level, let Digital Pivot get you there. We’ll be with you at every stage, using the latest technologies and methods to make sure your website, mobile presence, and marketing campaigns reach their full potential.